Having a Baroque wedding theme? How elegant and regal! 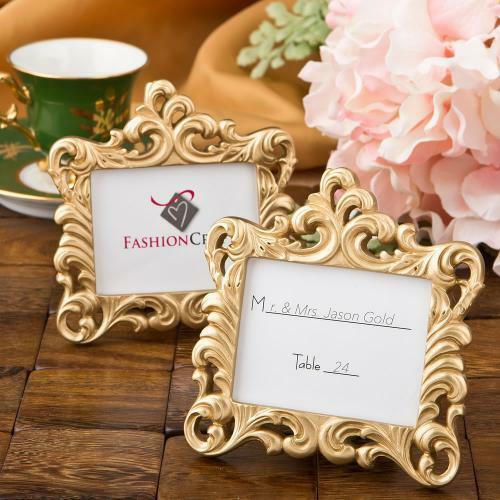 Our gold baroque frame favors are perfect fit doubling as your place card holder and wedding favors. A grand event demands grand table decor and your guests will be honoured to find their seating arrangements marked by these stunning place card frames. The frame is made from molded poly resin and hand painted in a beautiful gold finish. It features an ornate Baroque openwork design of swirls and twirls with a 2" x 2 5/8" opening for a photo or place card. The back of the frame has a black craft paper hinged easel with black tabs for easy insertion of your placecard or photo. This design is a classic that will enhance any grand occasion and remains a firm favorite with discerning buyers looking for that special favor. Size is 3 3/4"x 3 3/4"
Please allow up to 5 business days to fulfill orders; add ship time from NY.